Paris: Culture plays a key component in the friendly relations between the UAE and France, as both countries believe in the important the role it plays in the development and peacemaking, said His Highness Shaikh Mohammad Bin Zayed Al Nahyan, Crown Prince of Abu Dhabi and Deputy Supreme Commander of the UAE Armed Forces. Shaikh Mohammad made the remarks while touring the Shaikh Zayed Bin Sultan Al Nahyan Centre at the Musee du Louvre (Louvre Museum) in Paris on Thursday. The centre, located in the Pavilion de l’Horloge of the Museum, highlights the achievements of Shaikh Zayed Bin Sultan Al Nahyan. “This Centre embodies the values advocated by Shaikh Zayed, including values of tolerance, cooperation and peaceful coexistence among peoples, irrespective of culture, religion, race, and geographical locations. The visitors get to know about his rich legacy and his inspiring endeavours to champion values of humanity, peace, stability and development for all peoples of the world,” he added. Shaikh Mohammad described the Louvre Museum as a ‘global cultural icon’ that safeguards human heritage across different eras of history and promotes arts and creativity. Shaikh Mohammad noted that the Louvre Abu Dhabi, which was inaugurated in 2017, is a culmination of the profoundly strong relations between the UAE and France, especially in the cultural domains. He added that the museum represents an example of cooperation in celebrating the common heritage of humanity and turning it into a symbol of peace in a volatile world. “In today’s world, we need the common heritage of humanity to unite peoples and nations in the face of global challenges,” he stated. 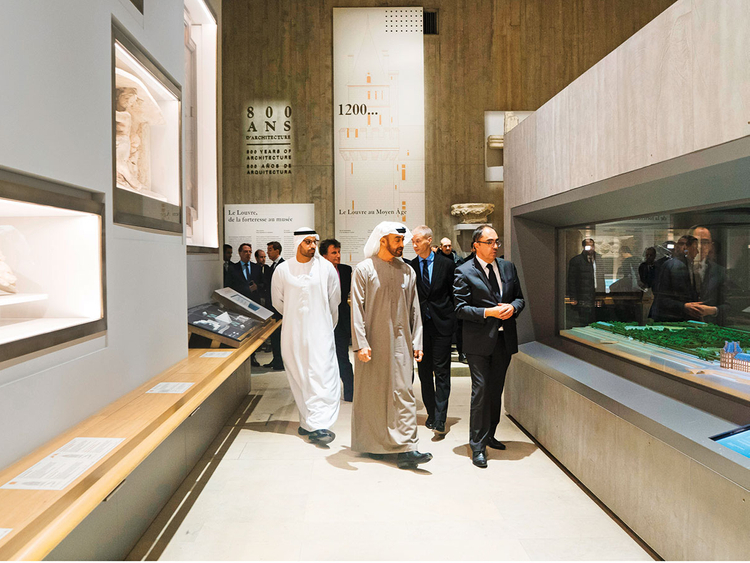 Upon his arrival at the museum, Shaikh Mohammad was received by Jean-Luc Martinez, President of the Musee du Louvre, and a number of officials. He was briefed on the different sections of the museum. Shaikh Mohammad stopped at the portrait of Shaikh Zayed Bin Sultan Al Nahyan and observed a minute of silence. He also toured the Louvre medieval (Louvre of the Middle-Age) and stopped at the Saint-Louis-du-Louvre and also at the Shaikh Zayed Centre, which tells the history of the Louvre and interprets the collections held at the museum to millions of visitors every year, strengthening collaboration between the UAE and France, particularly in the cultural field. 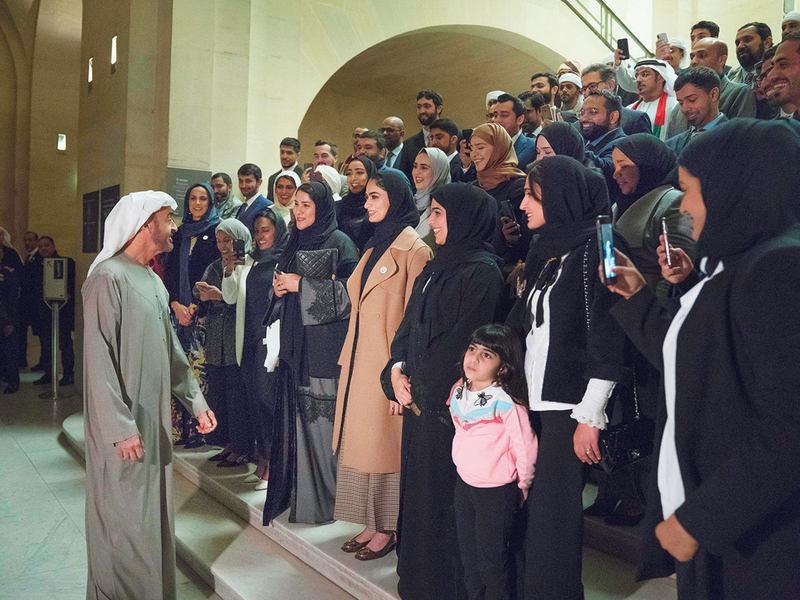 Meanwhile, Shaikh Mohammad met with a group of UAE students attending French universities and institutes during his tour of the Louvre Museum on Wednesday. While learning about their specialisations and academic conditions during the meeting, Shaikh Mohammad urged them to work hard and make diligent efforts to excel in their study so as to contribute — along with their other peers — in the development of the homeland. “My children, you are the ambassadors of the UAE overseas and serve as bridges of communication and interaction to convey the bright image of your country, its values of tolerance and coexistence and its civilisational and humanitarian progress to other peoples and nations,” Shaikh Mohammad said while addressing the Emirati students. He added that he was delighted at meeting with the students and checking on their conditions, affirming that Emirati students inside and outside the country are at the centre of the leadership attention, which he added, will spare no effort to provide resources to support them in their quest to reach their academic goals and excel in order realise their nation’s aspirations. For their part, the students expressed their joy at meeting Shaikh Mohammad, pledging to live up to the leadership’s expectations and confidence by obtaining the highest academic qualifications so as to contribute in the country’s development and progress. They also thanked the UAE leadership for providing them with every possible services, assistance and support to pursue their academic journey. Among those who attended the meeting were Shaikh Abdullah Bin Zayed Al Nahyan, Minister of Foreign Affairs and International Cooperation; Reem Bint Ebrahim Al Hashemi, Minister of State for International Cooperation; Khaldoon Khalifa Al Mubarak, Chairman of Abu Dhabi Executive Affairs Authority; and Mohammad Khalifa Al Mubarak, Chairman of the Department of Culture and Tourism in Abu Dhabi; Mohammad Mubarak Al Mazroui, Under-Secretary of the Abu Dhabi Crown Prince’s Court; and Lieutenant General, Eisa Saif Bin Ablan Al Mazroui, Deputy Chief of Staff of the UAE Armed Forces.